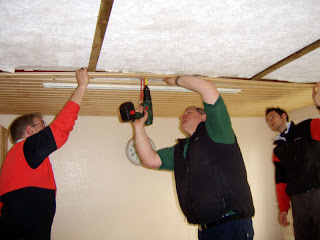 With things fairly quiet on the activity front (and some bad weather), there was plenty time to do a bit more work on the renovation of the staffhut building. 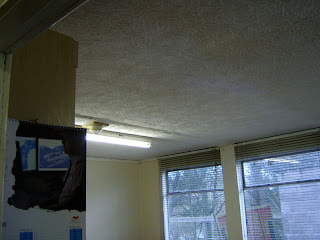 Next on the list was to replace the kitchen ceiling, which was looking a bit tired after many years of faithful service. 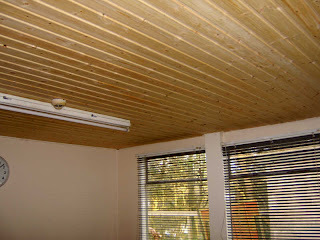 Above : Some fine handiwork by Laurence Llewelyn-Broderick and his team rapidly revitalised the old kitchen ceiling. 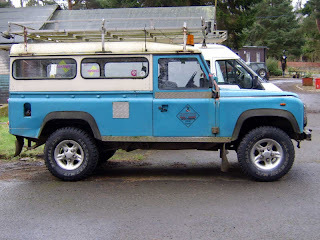 Keeping with the TV-show makeover theme, Team Fordell then turned their attention to the site vehicles, giving Bob's old landrover a 'Pimp My Ride'-style transformation. Having acquired a very very cheap and shiny set of alloy wheels recently, the team fitted these to the landrover - and immediately doubled its market value. Next project - 'Pimp My Tractor'?